After earning my Master's degree in geology at the University of Albany in the early 1990s, I worked for a couple of years for the New York State Geological Survey down in the State Museum. One of the geologists there at the time, and a hell of a nice guy to younger geologists like myself, was Dr. Yngvar Isachsen (since deceased). 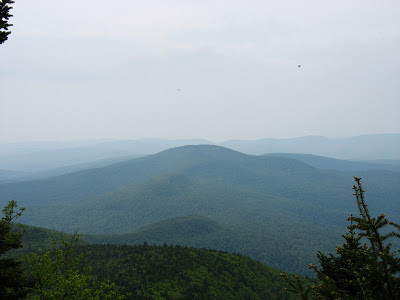 Yngvar was well known for his work in the Adirondacks but, at the time, he was interested in a circular feature up in the Catskills centered around Panther Mountain. He first noticed this feature in satellite images from the early 1970s, and it piqued his interest, but it wasn't until later that he started to more formally investigate. Yngvar worked at the Survey well into his 70s and could outhike people half his age! Let's go to Google Maps to view the area around the Ashokan Reservoir of New York. Now let's switch to satellite view to see what Yngvar noticed (it's easy now, not so easy to view satellite images back in the 1970s!). See that circular feature just northwest of the reservoir? Let's zoom in a bit. This feature is formed by the Esopus Creek (northern and western sides) and a tributary of the Esopus called Woodland Creek (southeastern side). Roads and homes were, of course, built along the stream valleys here in historic times. Circular features like this are generally caused in three geological ways - volcanic calderas, domical uplifts, or meteor impact craters. So what's forming this feature? Well it's certainly not a volcanic caldera - the geology is all wrong. There are no volcanic rocks anywhere in the Catskills and we know that area is simply composed of essentially flat-lying sedimentary rocks - shales, sandstones, and conglomerates. Hike anywhere in the Catskills to see them. What about a domical uplift like, for example, the Adirondacks a bit further to the north or the Black Hills of South Dakota or the Ozarks of Missouri? Well, these are generally caused by intrusions of igneous rocks like granite which push up the surrounding sedimentary strata. Again, the geology is all wrong. No core of igneous rock here and no tilted and folded sedimentary rocks along the flanks. Everything is flat-lying. How about a meteor crater then? At first glance, this looks all wrong too since the area is high and mountainous in the middle. Everyone knows that craters are depressions. Not so fast. You have to think like a geologist. What we see today is simply the modern landscape. This area looked very different in the geologic past. What if a meteorite struck here before the mountains even existed (yet still left a signature circular outline)? Well, to test his hypothesis, Yngvar started doing some fieldwork and research over the span of several years (mostly in his spare time). Walking around the Esopus and Woodland Creeks, he noted extensive jointing (joints are what geologists call fractures) in the bedrock of the streams. The joints were spaced about a foot apart there, some 10 times closer than jointing elsewhere in the surrounding rocks. That's what governed the circular course of the creeks - water will preferentially erode away rock where it's weaker and so areas of the bedrock with more frequent jointing will eventually form creek valleys. The real quest was why the jointing formed a circular pattern here? Another clue came from old gas well cuttings that were found in the State Museum archives. Turns out that other had noticed the circular pattern and thought it indicated a domical uplift associated with natural gas formation. A 6,000 foot deep well was drilled but didn't produce enough gas to make it economically worthwhile (fortunately for those of us who love the wild forests of the Catskills). Cuttings from the well were still bagged and archived so Yngvar and some graduate students started looking at them under a microscope. 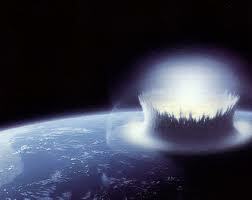 What they found supported the idea of an ancient meteorite impact. Iron-rich glassy spherules (left) and shocked quartz crystals (right). The spherules form when iron meteorites impact, vaporize, and then rain out little spherules which settled back to Earth. The shocked quartz forms when the crystalline lattice of quartz mineral grains experience shock waves and rearrange in parallel lamellae which can be seen in polarizing light under a microscope. Both of these features are excellent supporting evidence for a meteorite impact. Another piece of evidence came from an instrument called a gravitometer. These are sensitive instruments that measure the Earth's gravitational field. Higher density rocks in the subsurface will result in a stronger gravity field and lower density rocks will result in a lower gravity field. The rocks under Panther Mountain have a lower density which is consistent with broken rocks (breccia) expected in a meteorite crater. Piecing it all together gives the following scenario. Some 400 million years ago (before the pile of sedimentary rocks that became the Catskills formed), a large meteorite slammed into the shallow subtropical sea that once existed here (we know that because we have limestones of that age chock full of marine fossils!). The crater eventually filled with broken rock (breccia) and sediments. To the east, the Himalayan-sized Acadian Mountain rose due to the collision of a microcontinent that became what we today call New England. As these mountains eroded away, the sediments washed down to the west to form the Catskill delta system - a thick wedge of sedimentary rocks that today we see as the shales, sandstones, and conglomerates of the Catskill Mountains. As broken rock in the crater settles, fractures (joints) develop above the rims of the crater. Glacial erosion during the last ice age and modern stream erosion has formed the present-day topography of the Catskill Mountains (not true mountains, by the way, but geologically a dissected plateau) and the joints which formed about the crater rim controlled the erosional course of the Esopus and Woodland Creeks. Do we know this with 100% certainty? No. But it's a model that is consistent with the evidence and is the best hypothesis we have to explain this feature. Until someone comes up with more data (targeting drilling might give more, but it's expensive to do) or comes up with a better explanation that fits the data, this is what most geologists are going with (some are still skeptical). So, how big was this impact? H. Jay Melosh, a geophysicist at Caltech, has published equations to calculate such things given a variety of factors (density of the meteorite, velocity of the meteorite, angle of impact, type of bedrock impacted, etc.). Let’s assume a nickel-iron meteorite with an average density of 7,800 kilograms per cubic meter, a conservative impact velocity of 20,000 meters per second (almost 45,000 miles per hour), and a vertical impact coming into a shallow Devonian sea and striking a limestone seafloor. Given these assumptions, the impactor would have a diameter around 250 meters (about 820 feet). A meteorite this size would impact with an energy equivalent to 1,800 megatons of TNT – the combined energy of over 138,000 Hiroshima-sized (13 kiloton) atomic bombs! This obviously would have been a traumatic event for the marine invertebrates living in that sea and would have likely affected the global climate for a time. Such impacts shoot up a lot of debris into the stratosphere where it’s spread by jet-stream winds to eventually encircle the Earth. 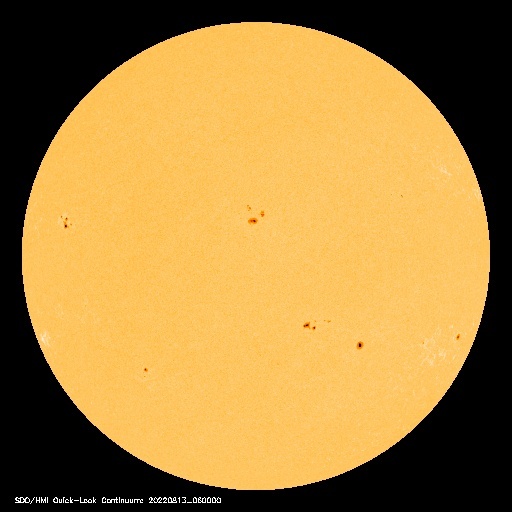 This dust will then reflect some of the Sun’s energy away resulting in a several-year-long cooling of the Earth’s atmosphere. This is sometimes called the “nuclear winter” effect after a number of studies on the effects of a (hopefully) hypothetical large-scale nuclear war; an event which would also throw significant amounts of dust into the stratosphere. Over the past few decades, researchers have recognized more and more ancient meteorite impacts in the geological record leading us to wonder when, not if, we’ll be hit again. Yet we continue to cut NASA's budget as they try to discover monitor the orbits of Earth-crossing asteroids! Shocked Qtz grains are pretty diagnostic for meteorite impact AFAIK, but the iron-rich spherules COULD be welding/ grinding debris from the rig's mud system. Quantifying the amounts of shocked Qtz and iron spherules against time/ operations in the drilling programme would probably help. An influx of spherules into the samples after a comment "repairs on mud pits" in the rig reports would be ... suspicious. Or you might be able to distinguish artificial spherules from natural ones. Plotting (coarsely) the shocked Qtz and spherule abundance against lagged depth for the sample may reveal abundance in some intervals of the well, scarcity in others. If that doesn't correlate with inferred history of infill of the structure and source of sediments (still excavting ejecta? ), then there's some explaining to do. I've never drilled a (putative) impact crater yet, in approaching 200 wells. But that's a "yet" ; I volunteered for work on the claimed "Silverpit" structure in the UK, before it's identification was challenged as tectonic instead of astrobleme. I couldn't agree more with your comment about Dr. Isachsen's character. He was a great man.